Accentuate your decor with this colourful mosaic pattern, hand made in the UK - add a splash of colour, pattern, texture and interest! 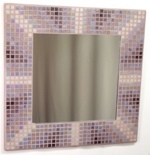 Home Studio crafted, fully tiled and grouted with small vitreous glass mosaic tiles, a choice of grout colours and mounted in an aluminium picture frame, this mosaic pattern accent will brighten up your walls. 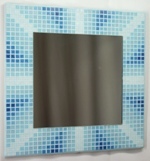 It is made from 475 tiles in 5 colours, with a nominal tiled size of 210mm wide x 276mm high (approx 8 x 11 inches). This photo shows the Jaded ZigZags patterned mosaic accent, seen normal to the wall mounted mosaic, including the aluminium frame. A range of 5 greens, including a gold marbled green, with a green grout. A graduated zigzagging pattern reminiscent of encroaching waves of emotion. This mosaic design is Copyright © 2012 Kaamar Ltd. Framed for easy wall hanging. Hang in Portrait or Landscape (any way up). Prefitted with adjustable hanging clips. 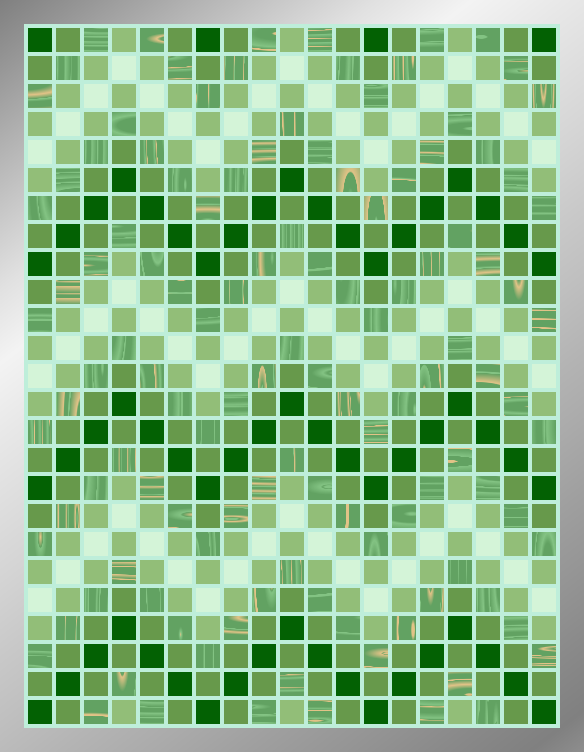 No of Tiles: 475 tiles (19 wide x 25 high) in 5 colours. Mosaic Size: 210mm x 276mm nominal (approx 8 x 11 inches). Frame: Aluminium (Matt Silver finish). Hanging: Use a suitable wall fixing that fits the clips provided (eg small screw/nail/hook). Ensure wall fixing can safely take mosaic weight. Framed Size: 228mm x 293mm x 24mm approx. 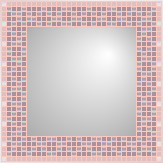 This mosaic design image shows the tile design and picture frame approximately to scale, including grout lines and tile colour blocks (see the colour note below). 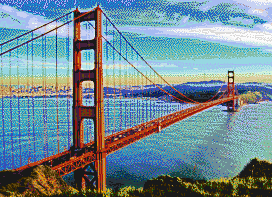 Click on the picture to view the mosaic design at original size in a new browser window or tab. Any special tiles used are shown impressionistically: Iridescent tiles are indicated by random colour highlights on the top/bottom of the tiles, while Marbled tiles are shown with randomised streaks and swirls. Currently we have limited supplies of this product available 'In Stock' - once supplies have been used up, this product will be unavailable, until/unless we choose to make more for stock. If you are a UK or EU consumer, you have the right to cancel an order that contains only 'In Stock' products under The Consumer Contracts Regulations 2013. In such cases, you must notify us of the cancellation by letter or email within 14 days after delivery. You will be required to return the goods at your cost within 14 days. 'In Stock' typical dispatch: 1-2 working days, 'Made to Order' typical dispatch: 1-2 working weeks.